Advertisement of Sara de Lahana's death in El Tiempo. April 16, 1926. Courtesy of the Archivo General de la Nacion, Mexico. It was early November 2010. The marigolds of the Day of the Dead altar in the entrance hall of the Archivo General de la Nación in Mexico City had begun to shrivel and the air's coolness penetrated the galleries of the erstwhile Panopticon-style Lecumberri Penitentiary, whose cells now held documents. 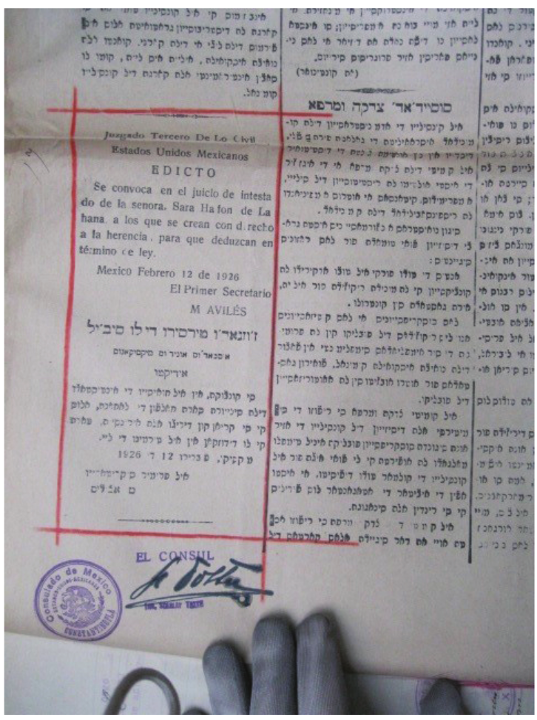 My hands trembled inside cotton gloves as I eased open the brittle pages of El Tiempo, the Ladino newspaper published in Istanbul from 1872 to 1930, a paper I was deeply familiar with, but from microfilm alone. In the April 16, 1926 edition, in Spanish and Spanish transliterated into Rashi characters in an approximation of Ladino, was an announcement from Mexico. Mexico's Third Civil Court was convoking a trial in the intestate case of Sara Halfon Fiss de Lahana. Those in Turkey who believed they had a legitimate claim to her estate should come forward. In the physical copy of El Tiempo in my hands, the notice was outlined in red pencil. It bore the signature of Scarlatt Tottu, Mexico's honorary consul to Istanbul. He would soon be stripped of his position due to allegations that he had made a private agreement with one of Halfon's cousins in Istanbul to receive 30 percent of whatever might be gleaned from the deceased's estate and that he was selling false Mexican passports. Registration document from Mexico's Registry of Foreigners for Sara de Lahana's son. Courtesy of the Archivo General de la Nacion, Mexico. Yet the circumstances surrounding the life, death, and afterlife echoes of the fifty-year-old married mother of four reveal far more than salacious consular scandal. Sara Halfon Fiss de Lahana was born in Rodosto (Tekirdag) in Ottoman Thrace as an Ottoman national; but she was interred in 1925 in the Monte Sinaí Jewish cemetery in Mexico City as an American national—despite never having lived in the United States. Her husband, Simon Lahana, born in Constantinople, was likewise an American national at the time of his wife's death, as were their four children. Or at least they were as he explained it. The American consul in Mexico City disagreed. Several years later, Simon Lahana was stateless, not because of any policy enacted on account of his religious affiliation, but because the United States rescinded national status acquired through the Philippines. His statelessness came to the fore because he had relocated to Guatemala, and then sought to immigrate across Mexico's southern border, sponsored by his four children who lived in Mexico City, ostensibly Americans. 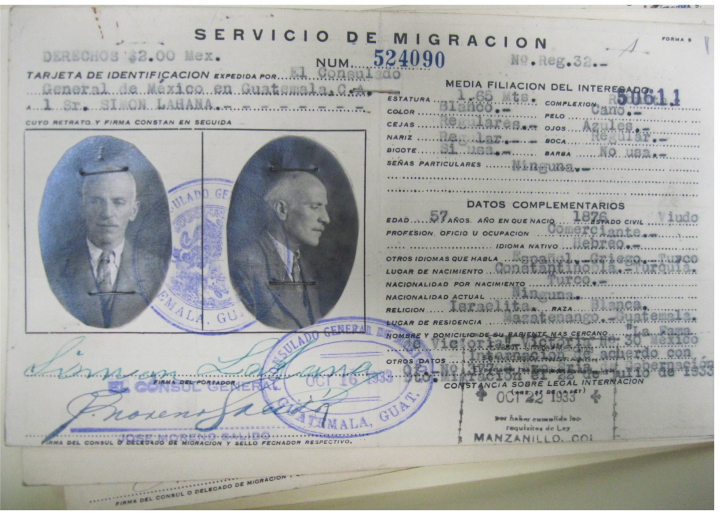 Borders and ports—and increasingly consulates and ship agencies—were sites where nationalities were proven or contested, but after arrival in a given place, Sephardic migrants often attempted to perform the national identity most expedient, whether or not it matched the documentation they carried. 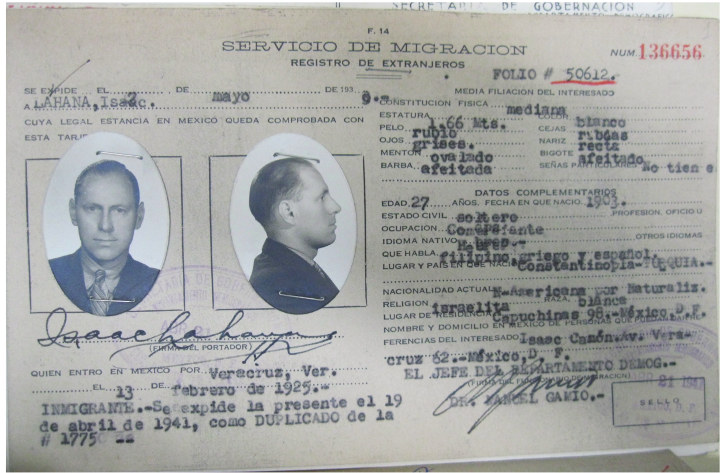 Registration document from Mexico's Registry of Foreigners for Sara de Lahana's husband. Courtesy of the Archivo General de la Nacion, Mexico. Indeed, the Lahana family's trajectory from Thrace to Constantinople, then Athens, the Philippines for the duration of the Balkan Wars and World War I, to Mexico in 1924, then the United States, Guatemala, and back to Mexico, was not the linear pattern that migration is often assumed to take. Nor did it follow the worn path of Jewish immigrants leaving poverty in the East for the golden land of United States. Rather, their movements reveal a circuitous path that crossed many borders over decades. Roughly one third of the Ottoman Jewish population emigrated in the waning years of the empire, and followed equally winding routes. The interwar years saw similar movements of Jews now living in nationalizing states. Relocating to entirely new lands was sometimes less fraught than adapting to life in a country suddenly familiar and foreign. 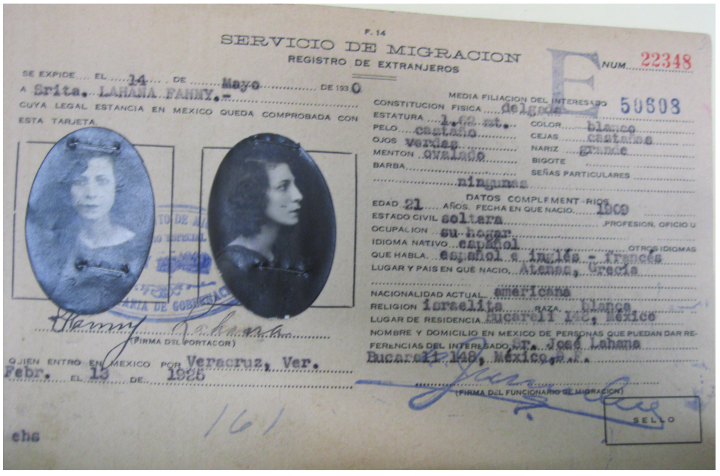 Registration document from Mexico's Registry of Foreigners for Sara de Lahana's daughter. Courtesy of the Archivo General de la Nacion, Mexico. Migration is intimately connected to nation building. The nation-states that arose after the tumultuous 1910s, whether, like Turkey, out of the ashes of the defeated Ottoman Empire, or like Mexico, out of the conflagration of a decade of revolution, viewed migration as crucial to shaping their national bodies to match a reimagined vision. Mexican intellectuals of the 1920s aspired to create la raza cosmica, a mixed "fifth race" that would draw from the best biological and cultural characteristics of other populations. In this spirit, the Mexican consul general to Vienna charged Tottu in Istanbul with attracting potential Jewish migrants from Turkey to Mexico. These "Spanish Jews" were, he explained, "not of the same abysmal moral condition of those of the north of Europe, given that these do assimilate and they are entirely equal to the Spanish." The Ladino press in New York, meanwhile, highlighted similarities between Ladino and Mexican Spanish and pointed to the near-simultaneous creation of the Sephardic and Mexican people. Sephardic Jews would do well in Mexico, articles posited, a viable alternative to the United States after the immigration quotas imposed in 1921 and 1924. In fact, a number of Sephardic Jews who lived in or even naturalized as Americans relocated across the southern border, at least for a time. They were drawn by ease of communication, an economic structure that was less rigid, and well-trodden commercial networks of Sephardic Jews linking Mexico, the United States, and France, sometimes extending to the poppy fields of western Anatolia. While Mexico of the early 1920s looked to Sephardic Jews as assimilable and even desirable, Turkish parliamentary discussions on migration emphasized that Jews, though not subject to "exchange" like Greek Orthodox residents and not as blatantly undesirable as Armenians, might be encouraged tacitly to leave. After the Turkish ambassador to the United States made an official visit to Mexico in 1934, he wrote back to Ankara that he encountered no Turks in Mexico. Rather, those "Syrians, Arabs, Armenians, and Jews," commonly called turcos, were from "portions of the old Ottoman Empire" and "have no connections to Turkishness." Exclusion from Turkishness had starkly different consequences for those Jews who lived in the republic and those who had emigrated. Nonetheless, Sephardic diaspora publications debated Turkification policies with a freeness foreign to the Turkish Ladino press, and the Turkish government sought to track down Jewish nationals in Mexico and elsewhere who had acquired a second nationality, one of a number of practices that entailed the stripping of Turkish citizenship and which would have dire consequences for Jews during World War II. The movements of Sephardic Jews both contended with and shaped a growing global preoccupation with migratory regulation. Yet individuals managed to squeeze through cracks in a system whose enforcers often proved both to be overconfident in their abilities to control movement and unsure of how to proceed. Simon Lahana was at first unable to claim his wife's estate because he lacked the requisite marriage certificate. Further, their four children's birth certificates had been lost "due to the great quantity of travels we have made." But he succeeded in removing the intestate case from Mexico's jurisdiction after arguing that none of his deceased wife's assets was in Mexico, a country to which the family had moved only months before her death. A New York Times announcement from May 1927 noted that her $6,000 estate would be divided between her four children, who were listed as residents of East 113th Street in Spanish Harlem. Simon and their eldest son had relocated here for a short time only after the intestate proceedings had begun. States required documents to travel, to stay, to marry, and to inherit. But papers were lost or stolen, purchased or falsified. The same individual could acquire and discard many identities over the course of a lifetime. Photo credit: Leisa ThompsonDevi Mays is assistant professor of Judaic Studies at the University of Michigan. 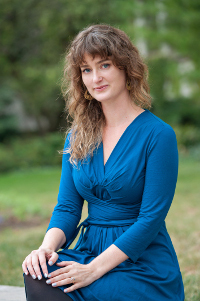 She received her PhD from Indiana University and was a postdoctoral fellow at the Jewish Theological Seminary. She is currently revising a book manuscript tentatively entitled Forging Ties, Forging Passports: Migration and the Modern Sephardi Diaspora.